We have the biggest of nearly everything: the tallest building, the biggest electric sign, the longest bridge, the most money. In Detroit, the city that came in first in Forbes magazine’s “Miserable Cities Index” last year, vast stretches of boarded-up storefronts and weed-choked lots tell of decades of abandonment and flight. Detroit has lost more than half its residents, falling this year to 700,000 from a zenith of two million in the fifties during its heyday as an automotive mecca. After decades of factory layoffs, amid aftershocks of the current economic crisis, more than a third of Detroit’s remaining residents are unemployed. Photographers, journalists, filmmakers, and gawkers flock to “the miserable city,” returning with image after image of collapse and decay, spliced with cautionary tales about the future of America’s urban landscapes. But abandonment, blight, and misery are not the city’s only stories. Detroit is also a tale of ingenuity, invention, and mammoth American Dreams whose icons still rise above the flat Midwestern landscape. Among my first impressions as a new arrival to Detroit in the seventies were an 80-foot tire looming over a field by Interstate 94, a 25-foot stove commemorating an era when Detroit was the stove capital of the world, and a baseball with yard-long stitches winding around its 55-foot diameter. On a freeway interchange near old Tiger Stadium, I was distracted by a fourteen-foot disembodied cow’s head, smiling down with pastoral detachment from between two ice cream billboards above Wilson’s Dairy. While walking along a sidewalk, I encountered three 30-foot whipped cream cans with pop tabs the size of trash can lids. But only after I had my first look around the Detroit Institute of the Arts and found myself staring, open-mouthed, at a giant light plug suspended from the ceiling, did I realize that a theme was emerging from my sojourn in Detroit. According to DIA literature, the giant light plug has, for decades, remained one of the most popular pieces in the museum’s modern collection. “People come in here. They speak in whispers, especially if they don’t know what they’re talking about,” said guard Thomas Johnson who watches over the museum’s upstairs rooms, “but when they come to the plug, they just say, ‘Wow!’"
The Giant Three-Way Plug is one of Claes Oldenberg’s repertory of monumental objects - a collection that also includes a 40-foot trowel, a 24-foot lipstick, giant ice bags, wing nuts, drain pipes and fried eggs. He made models for colossal windshield wipers to sweep the Chicago sky, and for a giant toilet float to span London’s Thames River, rising and falling with the tides. When asked about the inspiration behind his big ideas, Oldenberg alluded to a huge banana on a pier in Oslo where freighters unloaded, alas, bananas. “I used to love it as a child, then forgot all about it,” he said. Unsure over time whether this had been a dream, Oldenberg returned to Norway in the seventies and found the huge banana, half peeled, jutting into the air from the roof of a dock building. He had himself photographed, somber-faced, beneath it. A glance into the psyche of Detroit and its adjoining suburbs reveals a whole landscape of equally potent images. They include not only the giant tire, baseball, stove, and whipped cream cans, but also a 30-foot-long loaf of bread, a scattered herd of giant roadside and rooftop cows, and a 14-foot pencil that Paul Bunyan might have carried in his pocket when he roamed Up North. Motorists approaching the western outskirts of Detroit on Interstate 94 behold, in arching welcome, the world’s largest tire, standing on its edge off the freeway’s shoulder in the middle of an open field. On a clear day, flight crews can see the 80-foot Uniroyal from a distance of 60 miles and use it as a navigational aid. At night they are guided by a red beacon blinking from the top, which some area residents jokingly refer to as a UFO and others as a giant night-light. Which raises the question, is this growth benign or malignant? No one could be blamed, in the current depression, for envisioning the tire charging down the freeway to attack the city that bore it. Actually, the tire is more stable than the industry it represents. It’s made of flame-resistant polyester resin and fiberglass, coated to resemble rubber, and anchored to concrete pilings embedded fifteen feet into the ground. It can withstand hurricane-force winds and hasn’t budged an inch since its arrival in 1966. Before that, the tire did a lot of rolling. It began as a novel Ferris wheel for the 1965 New York World’s Fair, where Jackie Kennedy and the Shah of Iran were among the two million passengers who revolved slowly around its circumference in swaying gondolas powered by a 100-horsepower motor. But soon this wheel of fortune was heading home. After the fair and a short stint in an amusement park, it was anchored at its present site outside Uniroyal’s Allen Park offices; a project requiring 22 trucks, 130 days, and $250,000. Here it watched over the end of the turbulent sixties, the regressive seventies and eighties, the prosperous nineties, the reeling 2000’s with the same brazen imperturbability. Perhaps as a practical joke, perhaps as a tight-lipped protest from one of the city’s legions of unemployed, or maybe the work of celestial beings, a small arrow has become wedged into one of the tire’s mammoth treads. Rising by the side of Interstate 75 as you leave Detroit heading south stood, for more than three decades, a purer symbol: the world’s largest baseball. During the long hot summer of 1967, riot-torn streets of Detroit were partially cleared by nightly telecasts of the Tigers in a run for the pennant. Baseball: our national pastime, our sanest game, a long cool dream of hope. In 1968, the Tigers’ World Series victory cooled and, briefly, united the city. 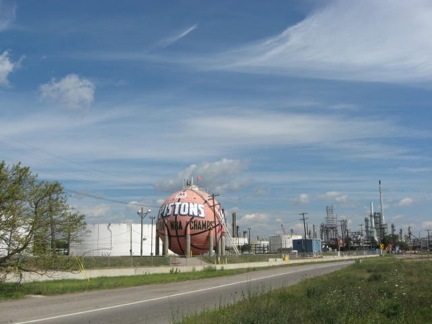 At the time the giant baseball was still only a 15,000-gallon, sphere-shaped butane tank at Marathon Oil’s Detroit refinery. Five years later, refinery manager George Lowe was seeking a patriotic contribution from Marathon for a bicentennial tour across America. “I kept staring at the tank and thinking that it looked like a baseball, or at least could be made to look like one,” said Lowe. “We contracted with some German painters from Mount Clemons to paint the ball and the words ‘Good Luck, Tigers’ in eight-foot letters on the tank’s surface. But the painters had never looked closely at an American baseball.” When Lowe returned to inspect the work, he found himself staring up at a giant soccer ball. “I told them the Tigers play baseball, not soccer,” Lowe recalled. So the painters once again climbed into the bos’n’s chairs slung from the tank’s staircases and began to recreate the optically confusing stitch pattern of the American baseball - this time with a 16-foot blueprint as guide. The completed project drew motorists to the freeway’s shoulder to snap pictures and stare at the baseball, creating traffic snarls on I-75. “People asked,” Lowe remembered, “if we were going to paint it like a football when baseball season was over.” For despite the game’s serenity, we remain a restless people, short on memory, and hence no match for our confidence men. Over the decades, the baseball grew two-faced. Southbound motorists saw a blown up replica of a baseball, pure and simple. Northbound motorists saw the same ball smeared with advertisements for television and radio stations. In 2005, following the Detroit Pistons’ 2004 NBA championship and “five game sweep,” the baseball was repainted as a basketball with “Pistons 2004 NBA Champs” emblazoned beneath the Marathon emblem. On Farmington Road in the Detroit suburb of Livonia, a 40-foot-long loaf of bread proclaimed for two decades that man cannot live by speed and sports alone. With slices nine feet high, it sprawled over a parking lot outside Awrey Bakery’s thrift shop. “When I was a kid, we all thought it was the greatest thing,” said area resident Barry Puckett. “We made every excuse to run over there and play near it.” Adults were intrigued too. A woman once called Awrey’s asking to borrow it to use as a float in Livonia’s Thanksgiving Day parade. “I hated to tell her it was a storage tank and couldn’t be moved,” said company maintenance supervisor Bob Griffen, who explained that the liquid shortening tank had been painted in 1975 to look like a loaf of Awrey’s Enriched White, blown up 67,000 times as if to feed the multitudes. What seemed like toy cars zipped along Telegraph Road near Michigan Avenue in Dearborn during the seventies and eighties, passing by three 30-foot Presto Whip spray cans aimed straight at the ozone layer, as if ready to shoot through it for good. The cans were removed in 1982 when the Delsoy Corporation went under, but older residents still remember. “All I can think of is the ‘Shake Well’ instruction on the side,” said David Sosnowski. “Hell, an earthquake couldn’t shake ‘em well enough.” Nevertheless, the cans so exactly duplicated the product sold at grocery stores that people often asked company owner David Whitehouse if cream would shoot out the top should someone manage to scale one and jump on its three-foot pop tab, where pigeons used to roost. Nearby residents frequently used the Presto Whip cans as landmarks to give directions to their homes, a useful function of all the big things. “No one knows where Scott Street is,” said Virginia Simco, “but everyone knew about the cans.” Her neighbors speculated about their size and purpose. “I’m from Texas, said Vela Cate, “and I’ve never seen anything like them there.” “I wanted to know more about them,” said Virginia’s husband Jim, “so I went over there and talked to the owner. He told me they were storage tanks for liquid sugar and soybean oil. Now that’s a functional thing,” said Simco. The big things are all functional. That’s part of their value as American symbols, what distinguishes them, for example, from the objects of Russia’s well-known idolatry of gigantacism. Visitors to Red Square are given a tour that reflects this difference, a continuing ritual I discovered first hand long ago as an exchange student in Moscow during the Soviet era. Tourists are proudly shown the biggest cannon ever built (too big to move, it was never fired). Then on to the biggest bell ever cast (which cracked from its own weight before it could be hung). Yankee ingenuity would never tolerate the waste: stick a beacon on top, let it store something, plaster it with ads. Let it earn its keep. On a platform above the trees in front of the Michigan State Fairgrounds where Woodward busses turn around and load, stood a Detroit big thing that failed to earn its keep and lay dismantled in storage for nearly three decades. The world’s largest stove, a 25-by-30-foot replica of a cast iron “Garland” kitchen range, was built by the Michigan Stove Company for the 1893 Chicago World’s Fair. Made of carved oak with ornate nickel trim, it was designed to be the centerpiece in a display with smaller stoves around its base. But it is unclear whether the giant stove ever made the 540-mile round trip to Chicago. No newspaper accounts, pictures, or other records of the display have been uncovered. Solving this mystery became the pet project of a former Detroit Historical Museum director, a man described by a member of the current museum staff as an eccentric with a bulging Adam’s apple who lived alone at Fort Wayne on the Detroit River and supposedly held revival meetings there. The historian compiled a fat but inconclusive file of inquiring correspondence. Maybe the stove never made the trip. Maybe it did, but was overshadowed by other exhibits - like a 122-ton Krupp Coast Defense gun and the biggest picture ever painted, which were also on display at the fair. But Detroiters who remember the stove from the years it sat on Jefferson Avenue near the Belle Isle Bridge (where it served as an outdoor ad for the Michigan Stove Company and later for Schafer Bakeries), or who later caught sight of it at the fairgrounds where it was moved in 1965, will find it hard to believe that the huge ornate thing could be ignored in any company. In 1973 the Michigan State Fair Commission announced that the stove would have to be removed; some of the trim was coming off, and the insurance company was threatening to cancel. A group calling itself SOS (for “Save Our Stove”) organized within the Detroit Historical Society to try to raise funds for restoration. “In the 1880s Detroit was the stove capital of the nation,” said Historical Society director Solon Weeks in an interview during the controversy. “When the auto plants took over, all the stove buildings were torn down. This is the last tangible link to that era.” But the SOS campaign was unable to gain public support. After all, the stove would be expensive to repair and was useless anyway. For 26 years, the stove’s blue pedestal stood empty. As summer fairgoers nibbled on corndogs and deep-fried pickles beneath the platform’s massive shadow, the stove lay dismantled at Fort Wayne like a pile of dinosaur bones. Then in 1998, as if to proclaim that big things will not be ignored, the stove reappeared on its former perch, where it outlasted even the state fair itself. Last summer, debt-ridden Michigan’s governor canceled the 160-year-old summer tradition, leaving the world’s largest stove to reign over barbed wire and silence. Finally, only the gods proved a match for the wooden Goliath. Struck by a bolt of lightening during a thunderstorm in August 2011, the giant stove burst into flames. On Ecorse Road in Ypsilanti stands a colossal emblem to the Detroit area’s bucolic past. Back in the sixties, Tom Carpenter struck upon a way to beef up his drive-in grocery business. He wrote an amusement park supply company in Sparta, Wisconsin to ask if they could fashion for him a giant cow. Months passed with no reply, and Carpenter forgot his idea. Then one day a semi truck rolled up to his Carry Dairy, and the driver began to unload 1,200 pounds of plastic and steel on the hoof. This was no mere smiling head like the Wilson’s Dairy cow I’d glimpsed from a freeway interchange upon my arrival in Detroit. From horn to flank the cow that emerged from the semi truck was nearly as long as Carpenter’s store. Carpenter hired a crane to hoist the cow onto his roof, then had it bolted down and buttressed with guy wires. Since then it has hung right in there. Kids from the neighborhood high school often threatened to steal it and haul it to the top of a nearby water tower, but so far no one has been able to budge it. Carpenter glanced up at the roof where the brown cow still stands, 22-feet long, heavy uddered, and bathed in yellow floodlights. “I guess someone is watching over us,” he said. When the Commission finally approved it, the pencil was built of high-impact plastic and filled with fluorescent tubes that lit up the dark stretch of Six Mile at night. As if to make one final protest, a semi truck backed into the pencil shortly after construction, but it was restored. From one perspective, the big things are simply outrageous - symptoms of a malignant commercialism. But city councils aside, we are not offended by them, perhaps because we encounter them not as advertisements but as cultural expressions. They are the art of a people with no time for art. They represent what we do, blown up in unashamed acknowledgment, without even the sardonic irony or deliberateness of Pop Art. We are fascinated at how the big things faithfully depict the life we are living, this one, down to the pop tabs and the fake rubber tire treads. They also make a nostalgic appeal. They transport us back to the perspectives of childhood, when a chair was an exercise in mountaineering and the world above was full of day-to-day pleasures and surprises. Here is a level beyond interpretation. You are blinking up at an 80-foot Uniroyal Tire. “Here I am,” it shouts.